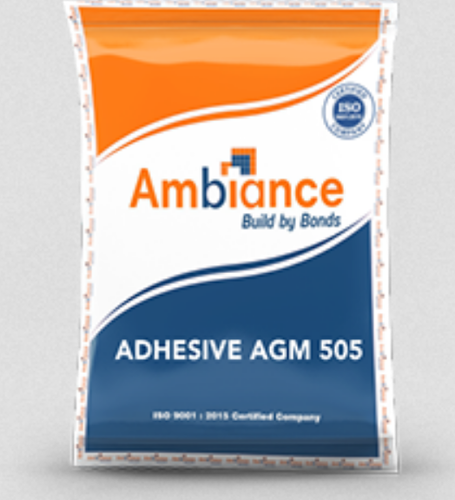 AMBIANCE AGM 505 is adhesive to fix the Glass Mosaic, Vitrified, Ceramic Tiles and Natural Stones which is suitable for external & internal walls and floors. The product comes in a dry powder single pack system. It is made of Natural Mineral, Inorganic fillers, High Quality Polymers, cement etc . It keeps its strengths for years together. AMBIANCE AC 103 is adhesive to fix the Ceramic Tiles which is suitable for internal walls and floors. The product comes in a dry powder single pack system. It is made of Natural Mineral, Inorganic fillers, High Quality Polymers, cement etc. It keeps its Strengths for years together. Add 6 – 7 liter of plain water into the clean tub. And then under mixing (Mix either by hand after wearing gloves to hands to avoid irritation or with a slow speed mixer to make the dough smooth, consistency and free from lumps) slowly add the supplied adhesive powder. Allow dough to react for 10 minutes. Add water based on consistency if necessary. Select the notched trowel based on the tile size for the dough application. All surfaces should be leveled, clean, structurally sound, normal absorption (cured surface with water) and free from all dirt, oil, grease, paint, concrete sealers etc. Cement Plaster / Cement Mortar Bed / Concrete surfaces. Plywood Boards / Swimming Pool etc.